Whether your event is held at a National Training Centre or within your organisation’s facilities, using Twitter to engage with attendees before, during and after can provide exciting insights, all in real-time. These insights can be used to improve future training events, or simply understand how attendees are benefitting from them. There’s no doubt that using Twitter during an event can create a real buzz if people are encouraged to join in and create conversations. How do I use Twitter for the training event I’m planning? Would it be appropriate to Tweet from your organisation’s official Twitter account? Or should you create a whole new account? 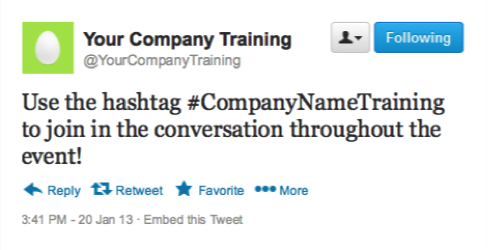 It might be a good idea to create a handle to use for training events only – this ensures that event tweets do not get mixed up with external communications. If it’s possible to get equipment to display your Twitter feed, make the most of this. It will encourage participation if people are able to see their tweets on a screen. Instructions of how to set up your feed are available here. It’s also a good idea to select a training centre with fast Wi-Fi. 4. Ask attendees questions and join in the conversations! During the event, ask attendees questions about what they are learning – remember to use the hashtag! Use the hashtag to reinforce key messages, tweet photographs of the event and remind attendees of the schedule. Also, join in any conversations attendees are having about the event – retweet, favourite and reply! Simply search for the hashtag after the event to quickly learn what people have been saying – the hashtag will have created a searchable footprint of your day full of insights from the attendees. Alternatively, if you use a social media monitoring tool (some are free), you can quickly gather all tweets surrounding your event. If you’re looking for a national training centre, or a UK training venue with residential facilities, contact Yarnfield Park.